[S310] James John Weidner, Minnesota State Department of Health; Division of Birth and Death Records and Vital Statistics; Certificate of Death, city and state of birth only. [S314] Hugo Jacob Weidner, Minnesota State Department of Health; Division of Birth and Death Records and Vital Statistics; Certificate of Death, date and state of birth only. 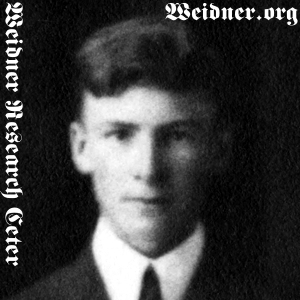 [S625] Frederick Clarence Weidner, State of Minnesota; Division of Vital Statistics; Certificate of Death, Birth state only. [S625] Frederick Clarence Weidner, State of Minnesota; Division of Vital Statistics; Certificate of Death. [S310] James John Weidner, Minnesota State Department of Health; Division of Birth and Death Records and Vital Statistics; Certificate of Death.